My name is Giorgio Demurtas, I am a 32 years old Italian engineer passionate about electronics and renewable energy. 2016: PhD in Wind Energy at the Technical University of Denmark, DTU. 2012: MSc in Wind Energy at the Technical University of Denmark, DTU. 2009: BSc in electrical engineering at the University of Cagliari. 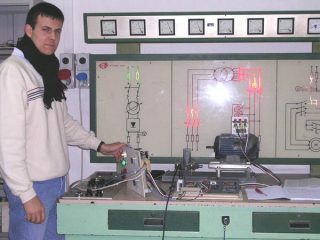 2005: Diploma in Electrical Engineering and Automation at ITIS G. Marconi, Cagliari (Italy). 2018: Innofounder start-up accelerator, based in Copenhagen. I develop my company Startak to provide competitive control systems for solar trackers. 2017: consultancy regarding the pitch system of a 15 kW turbine for the German wind turbine manufacturer Enbreeze GmBH. 2016: detailed engineering of a 20 kW wind turbine. Loads calculation (Simplified load methodology), design of frame, hub, main shaft. Finite elements modelling and blueprints. Choice of bearings, yaw bearing, gearbox, generator, yaw motor, yaw gearbox, brake, design of power and control system. In 2015 I took a break from the PhD and I designed and programmed the control system of a pitch regulated variable speed wind turbine, for the Italian wind turbine manufacturer Aentula Srl. 2012-2013: engineer in the “Test and Measurements” section of DTU Wind Energy (former RISØ, a research center recognized as a world leader in the field of wind energy) dealing with performance measurements on large wind turbines. 2012: I worked in Barcelona for Alstom Wind (now General Electric) to analyse meteorological and wind turbine data for the design of wind farms. 2009-2010, at the age of 24, I designed and installed twelve photovoltaic plants with power up to 20 kW, with the “Piccolecentrali Srl” company that I registered after graduating in electrical engineering. How can I help you? get in touch. When I was 10-12 years old, in summer I used to spend the days in the workshop of my uncle Maurizio looking at repairs of refrigerators and electric motors. There were so many interesting objects in his workshop, which triggered my curiosity towards electricity. Maurizio would explain me how to use the machine to wind the coils for the electric motors, and once done, he would explain me how to place them in the stator and so on to the next operation. It was very rewarding for me to be able to make something that many people older than me had no idea how it was made. When I was about 12 years old, I stepped into a book of my dad: “Collection of schematics of electric circuits”. I started to look in it and asked my dad if he could buy me some lamps and switches to try out some circuits. I clearly remember my chin just a span above the desk of the electric shop, looking at those shiny small incandescent light bulbs, and lamps holder with small threads and two terminals. 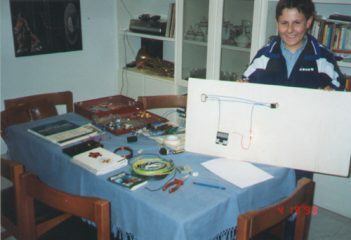 Here is a photo of me, 12 years old in 1998, showing a lamp controlled by two multiway switches. The beforehand mentioned book of schematics is on the table, with white-blue cover. My dad used to take me to his work place time to time (water treatment plants, pump stations…). I was fascinated by welding operations at night for the repair of large water pipe-lines, excavators, cranes, control rooms with many many coloured lamps and wall-size schematics. Rooms stuffed with electric cabinets and a jungle of small and large pipes. The agreement was that I could look, but keep my hands in the pockets and not walk around. When I was 15th, I participated to a contest of ideas which was part of the “science week” in Cagliari. 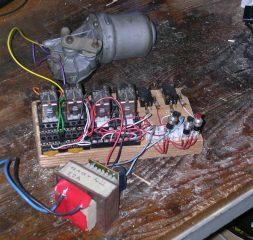 I submitted my design of an automation system based on relay logic to control the motor of a gate with limit switches. 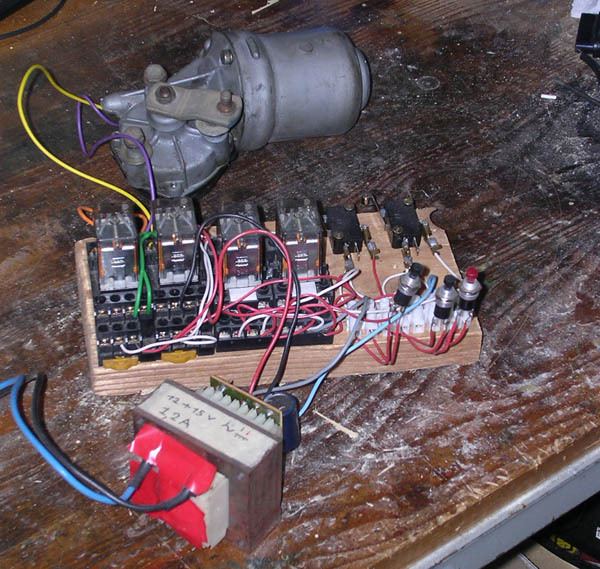 It employed a 12V wiper motor form a car, 4 relays, 3 push-buttons (open, close, stop) and two limit switches. All I was taught was that a relay could open/close the contacts when a voltage was applied to the coil. I found it quite obvious, as I could clearly see it trough the transparent body of the relay. My schematic was a “bird nest”, and Prof Guido Pegna taught me how to draw a schematic diagram using the proper technique. I followed his suggestion and the schematic became much more readable. I was awarded the second price. I was fascinated by those devices called “PLC” in the modern control panels which could be “programmed” by use of a computer to perform operations of endless complexity, which would have been very complicated (if not impossible) using relays. 14th to 19th years of age (2000-2005) I attended the technical school for “Electrotechnic and automation”. My school had 800 boys and 5 girls, 3 of which in my class. The second year I was elected representative of the students. At the age of 17 I was In my 3rd year of studies. During the strikes there were not many of my class mates at school, and I could ask and get the permission to attend lectures of the 5th year. It was very interesting for me to have “a look forward”. Years after I graduated I met one of my professors, Carlo Ligia, and he told me that I was asking very relevant questions. 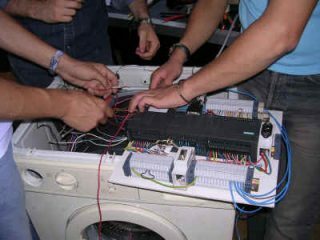 In 2001 a friend of my father borrowed me a PLC (Siemens S7-200) along with the software to program it and a start manual for beginners. I could complete the examples of the book and a few days later I could implement software with my own logic. The year after, we started to used PLCs at school. When I was around 18 years old I had got my driving licence, and for some time I picked-up broken washing machines from near the garbage bins, repair them (with some tips from my uncle), and sell them to the second hand shop. One day I came home with the nth washing machine, while five were standing in line in the garage of my family. My mum and dad weren’t so happy of all that mess, and asked me to return the washing machines to the garbage. I tried to convince them that this was worth keeping because it had a broken timer (electromechanical type) which I wanted to replace with a PLC (that would have been fun!). My dad suggested that I should do this experiments at school and not at home. So, the day after I brought the washing-machine to school. I didn’t ask for permission, I simply parked and asked some of my class mates to help to carry it trough the school main corridor up to the lab. Everyone watching was entertained, it was definitely unusual thing to see. Then, once the washing-machine was in the lab, I illustrated the idea to my professors Pinna, Sandro Manca, and Gianmario Fadda. They agreed, and me and my class mates started to work on it. To accompanying my school learnings, I also had the opportunity to spend one-two month intern-ship in several companies: “Cacavale” on installation of electric plants in industrial buildings, “Air Dharma” on pneumatic systems, and “Vitrociset” on military electronic and calibration of instruments. I graduated in 2005 with top grades, and I had always had the maximum score in the subject “automation systems” which was taught by Prof Gianmario Fadda. After the diploma I was fully satisfied with my knowledge. I was able to design small and large electric installations, MV/LV transformer stations, perform tests on several types of electric machines, program automation systems. Before I could sign a design I had to work for someone for 2 years, or do the Bachelor in electrical engineering (3 years). My dad suggested that I take 3 years BSc, and I was of the same opinion. The first year of the BSc was TERRIBLE.